This Tuesday, FCC Chairman Ajit Pai will visit the Bay Area, supposedly for a “fireside chat” with tech executives about bridging the digital divide for underserved communities. But Chairman Pai’s brief tenure to this point has been defined by actions that undermine digital rights, such as seeking to rescind the Open Internet Order of 2015 that protects net neutrality via light touch regulations to ensure equal opportunity online. Since Mr. Pai’s appointment in January by President Trump, their lobbyists have flooded the agency and the offices of Congress, pushing for an unwinding of rules that they say hamper their businesses…. Mr. Pai has been an active figure in the Trump administration’s quest to dismantle regulations. He froze a broadband subsidy program for low-income households, eased limits on television station mergers and eased caps on how much a company like AT&T or Comcast can charge another business to get online. Pai’s appearance in San Francisco will prompt protest, as his proposal is overwhelmingly opposed by the public, including both Democrats and Republicans. Outside the location at which he’ll meet with tech executives, EFF and a number of allied organizations (including the Center for Media Justice, ACLU of Northern California, The Greenlining Institute, CREDO, 18 Million Rising, the Media Alliance, Tech Workers Coalition, and more) will host a rally to which all are welcome. The open Internet has provided connection and community across boundaries and distance, allowed alternative music, art and information to find its audience, allowed small businesses and startups to find their customers and allowed activists to organize online to talk back to their government. We need to keep the Internet accessible, open and uncensored. Title 2 net neutrality regulates the Internet as what it is—a vital utility and a public good that belongs to all of us. The Internet has developed into a diverse and innovative platform thanks in large part to the requirement that Internet providers treat data equally, without discriminating between data from one source versus another. This neutrality has been a defining cornerstone of the Internet’s architecture since its early days. Both innovation and dissent rely on Internet users—not the company providing them bandwidth—being in control over what they read and say online. If those companies are allowed to play favorites, or to hold their customers hostage to demand tolls from those who want to reach them, opportunities for both job creation and meaningful dissent will predictably wither. We can't let that happen, and neither can you. Start now by raising your voice online to share your concerns with your members of Congress, then join us in the streets on Tuesday. If you’re looking for an ongoing way to make a difference, gather a handful of neighbors or friends who live in the same town and join the Electronic Frontier Alliance. 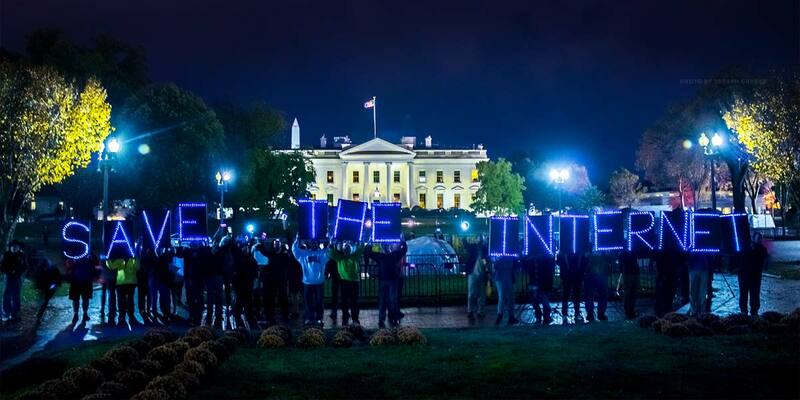 The fight to save net neutrality will take all of us.